The Dialogue Community of Practice offers four masterclasses a year, where we hear from experienced practitioners on dialogue and themes the Community wished to learn more about, such as Public Engagement and Dialogic Principles. The master-classes include input from experts and academics, and also allow the community to spend time in dialogue about the learning and how they might apply the learning in their context. For more information on upcoming dialogue events, please visit our events page. 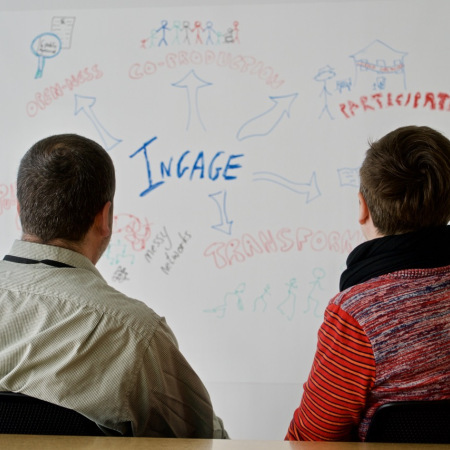 The Dialogue Community of Practice offers Practice groups, a chance for community members to come together and practice dialogue in a safe, facilitated environment. We offer a Beginners Group so people can learn about the underpinning theory and learn to spot patterns in conversation and their own contribution. We also offer an Experienced Group where people have been working with dialogue can deepen their practice. This is a generative dialogue on the work based issues people bring. To join a practice Group, please register your interest here. We have a number of people who can work with teams to enhance their team working or facilitate a dialogue for a team/system. We can also offer tailored practice groups around a particular theme or work area. Recently, we have supported a practice group of OD and learning professionals across Lothian to develop their skills to support the integration of health and social care serves. You can learn more about this work in the Dialogue in Action video. We have a number of resources, including videos, newsletters, articles, and materials from Masterclasses available on both the Workforce Scotland website and on the Knowledge Hub. Members of the Knowledge Hub group can also contribute to threads and discussions on the forums. We also are creating a series of digital stories on Dialogue, including A Beginners Guide to Dialogue, which can be found on the Workforce Scotland Vimeo channel. We are starting up a Book Group, for those interested in reading about supporting transformational change, including topics such as Dialogue theory, leadership and organisational structures. Book Group members can meet in person, or join in discussions online. Our first book is Frederic Laloux’ Reinventing Organisations, and the first scheduled meeting is 18 June 2015, in Edinburgh. For more information and to join the book group please share your details here or email info@workforcescotland.com.